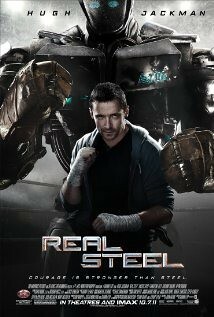 "Set in the near future, where robot boxing is a top sport, a struggling promoter feels he's found a champion in a discarded robot. During his hopeful rise to the top, he discovers he has an 11-year-old son who wants to know his father." source imdb. # the movie doesn't bring anything new to the table but the presentation is still fun and entertaining for the whole family. # watch it if you like Rocky, Over the Top or any boxing related movies.